Kyle Smith at the New York Post debunks the film Kill the Messenger. In 1996, the subject of “Kill the Messenger,” journalist Gary Webb, published stories that created the impression that the CIA was behind the crack epidemic. Maxine Waters and Louis Farrakhan believed him. Webb’s own newspaper, the San Jose Mercury News, then re-reported the story and delicately backed away from it. Later it accepted his resignation. Webb’s key sources then called him a liar to reporters for Webb’s own paper, the San Jose Mercury News, which accepted his resignation. Now Webb is recast as a gritty, determined hero, played by Jeremy Renner, in a star-studded movie. Only in Hollywood, kids, only in Hollywood. 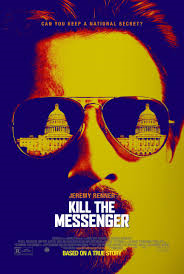 As the filmmakers spin Webb’s story out of visits with drug lords and convicts, “Kill the Messenger” tries to be the “JFK” of crack, but offers only shrill self-righteousness to answer the crazed energy of Oliver Stone’s masterpiece of deceit. First off all, if you have an opinion that you truly believe in, why do you hide behind the tag Anonymous? Secondly, as noted above, Smith reported correctly that Webb's stories were debunked by several large newspapers who investigated the allegations, including Webb's own paper, and those reporters do more than just watch movies. I've been around the country and world with the U.S. Navy and the Defense Department, and I've worked with the other government agencies, including the CIA. And as a writer I've coverd the CIA, the FBI, the DEA and the other government agencies, including the military, and I don't buy Webb's allegations. As for killing the messenger, Webb killed himself. And I'm willing to sign my true name.